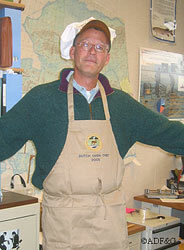 Charlie Swanton shows off the trophy apron, won in the 2005 Fairbanks ADF&G Dutch Oven Cook-Off for this salmon recipe. Layer potatoes, fish, onions, begin and end with layer of potatoes and sprinkle flour and pepper on each layer of potatoes. When finished layering ingredients, dot top of potatoes with butter and pour in milk. Hint: It really is best after cooling overnight and heated in microwave. This dish won the much coveted chef’s hat (1st place) at the 2005 Fairbanks ADF&G Dutch Oven Cook-Off!